This is a picture that Chandy had taken at her shower. Chandy is the one in the middle, Melissa is the one on the right and I'm the one on the left. Here are the details that make this so cute (or at least I think so). All three of our 'baby daddies' played lacrosse together at Texas Tech. Melissa is due in April, I am due in May and Chandy is due in early July. Almost exactly a month between each of our due dates...way to go lacrosse guys!! Melissa and Eric will be having a little girl (Ella Kate), Chandy and Zach are having a boy (Rocco) and Mark and I are having a girl (Chloe). I can't wait to get these cute kiddos together for playdates! I'm so thankful that Chandy thought to have this picture taken...it's going in the baby book for sure! Kim,I love the idea your friend came up with of happy and proud Mothers to be. That is priceless. You look great. All of the children will have fun trying to out do one another as they grow up.Love you honey. Cute, cute pic. Dad said you have really "boomed" out since the last time he saw you. lol Glad the picture was taken so someday all your kids can have a giggle. Cute shirt! 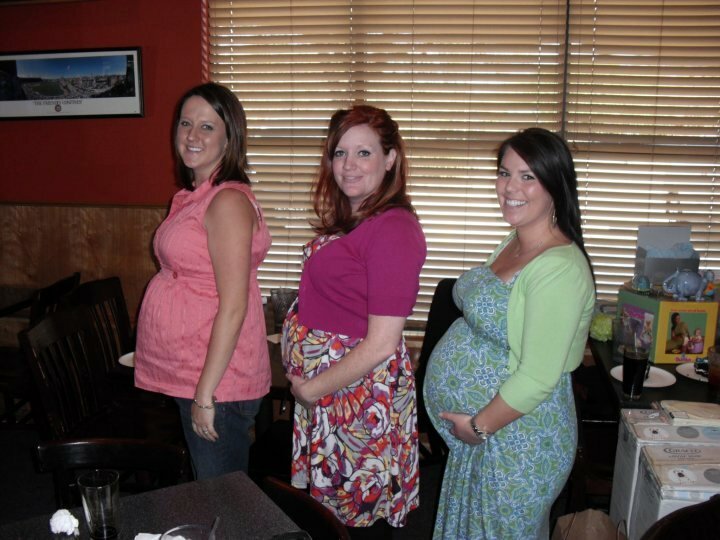 How fun to be pregnant with your friends! Fun picture and you look great! Love you! Ha ha. Thanks, Tori. Glad you recognized it! The last two pictures of me I have been wearing shirts you sent. thats a reall cool picure and even cooler situation. You guys can all share trade secrets!